Soak the green lentils overnight. Drain and add plenty of fresh tap water and boil for around 40 minutes. You can also use canned green lentils which you don't need to soak and boil. Grind the walnuts using a kitchen machine and put aside. Finely chop the onion and garlic. Heat the butter in a frying pan and gently fry the onion and garlic for around 8 minutes until soften and slightly browned. Put the onion and garlic in the kitchen machine and add the ground walnuts, thyme, bread crumbs, tomato puree and seasoning and mix together until it has a sticky consistency. Butter a medium sized bread tin, making sure you have spread butter on all the bottom and all the sides, using extra butter for the corners. Spoon in your lentil/walnut mixture and smooth the top. Put a layer of aluminium foil on the top and bake in a 190C (gas mark 5) for 1 hour. Leave in the tin for around 5 minutes before you either tip it over onto a plate and slice it, or slice it while still in the top with a plastic or wooden spatula (so that you don't damage your tin). You can serve this dish with any winter vegetable, like cooked cabbage, carrots and potatoes. 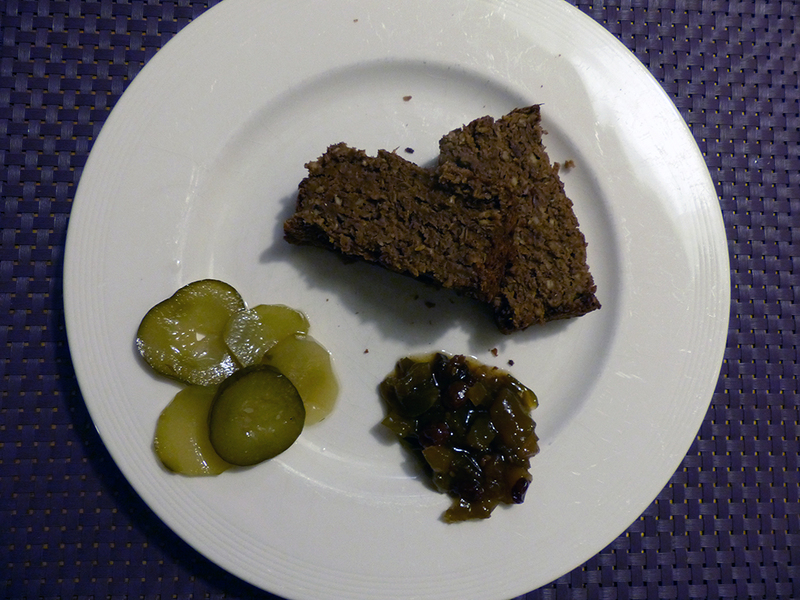 Or you can serve it with (homemade) tomato chutney and pickled cucumbers or gherkins.